All of the cards were run through several 3DMark benchmarks. Note that both the 9800 GX2 and the 3 Way SLI setup were both run through an extra benchmark at 1920 x 1200 with 8 x AA. 3DMark03 is a benchmark that uses mainly a DirectX 8 feature set including several pixel fill-rate tests. I included this test in the review to see an approximation of how well old games will play on the current gen cards, as well as how well each card copes with the fill-rate tests. 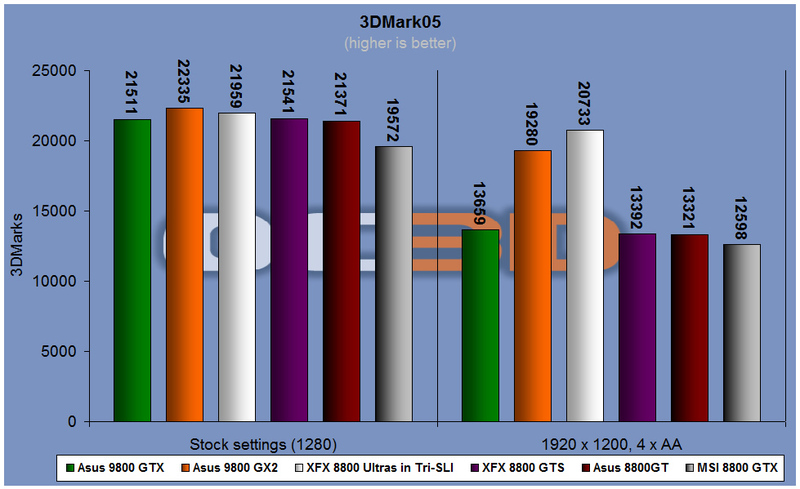 3DMark03 shows a small improvement over the GTS, but the overclocked GT beats it out. 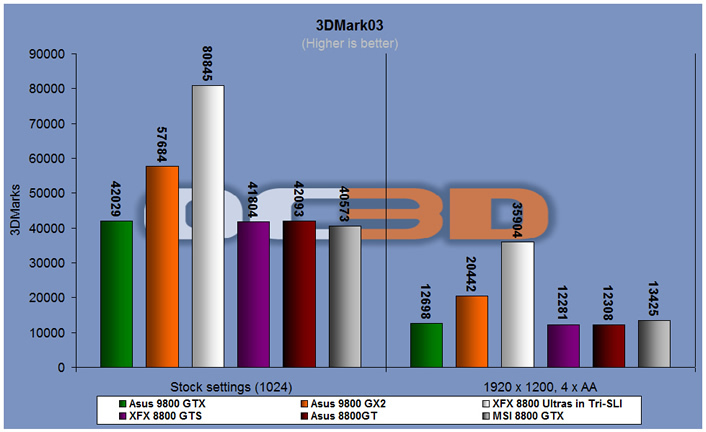 At a higher resolution and AA the 8800 GTX surpasses the 9800 GTX pretender by a margin. 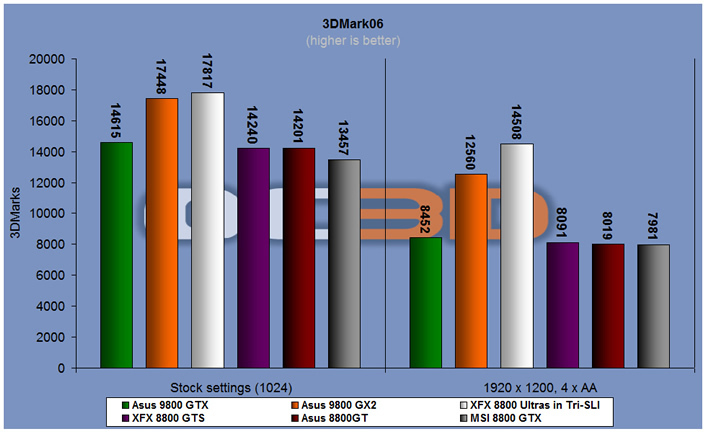 3DMark05 again shows the same pattern, but this time at the higher resolution the 9800 GTX beats the 8800 GTX. Nudging ahead in the newer 3dmark06, the 9800 GTX tops the single GPU chart by a way in both low and high resolutions. Ahhh man gotta go work... no time to read. That's a good, well rounded review - much appreciated. I won't be swapping my 8800GTX - but for for someone buying a card, well... is a much lower priced 8800gt better value? How would anyone feel spending £210 on this (lowest I've seen), knowing the next gen chips (if they really are next gen) are just a few months away? I'm in a bit of a situation. My X2 died a death and it needs replacing. It cost £270. I was going to upgrade to the GX2 and cough up the extra £120ish as the other reviews I have seen of the gx2 show it smoking crysis etc (they included youtube vids/screenshots to give an idea, mascaras @ xs iirc). That and a few other things sold me. Now, I have my 88GT atm as backup but it is sold to my mate who is the slowest pc builder in the world so I can't keep it forever. The 9800GTX is ~£220 so if I got that as a replacement I'd get £50 back. I'm not very impressed with the 98** series so far, but at least the card is reasonably priced and is a good buy for someone who doesn't currently own an 88** card. Nothing established as to the extra 6 pin power requirement ? If I`m not buying for a new pc, I don`t think I`ll bother. Need to get out of this plateau of similar cards released ~£200. 9800GTX in SLI vS GX2 - that`d be interesting.